Ask the right questions, find a trauma therapist. – Diana C. Pitaru, M.S., L.P.C. I have seen my fair share of shrinks throughout my adolescent and adult life, looking to find a trauma therapist. I’ve experienced all sorts of therapy methods, in different corners of the world, with specialists and generalists alike, cognitive, psychodynamic, behavioral, person centered, and existential therapists. In fact, the reason why I became a psychotherapist has to do with the often questionable practices that past therapists engaged in and my desire to do better, learn from the things they did well as well as their mistakes. My very first therapist I had as a teenager was a psychiatrist that would take everything I shared in session and pass it along to my family members and others outside of it as well; this was the first time I thought of becoming a psychotherapist, a better therapist than the one I was seeing at the time. I also had the therapist that would quietly nod without offering much comfort or feedback, the one that would interrupt me because the things I wanted to focus on were not on her therapy agenda, and also the therapist that would avoid certain topics altogether, because (I imagine) she did not feel comfortable addressing difficult or hard issues. I’m sure you’ve come across articles that describe what to look for in a therapist and what questions you should ask prior to hiring one, but I am fairly certain you haven’t read a whole lot about asking your therapist about their own experience with therapy and why that information is so important. Is it possible to help someone in therapy if you, as a therapist, don’t have the experience of being in therapy? Yes and no, or yes up to a certain point, particularly if the person presenting for therapy struggles with deeper more complex issues such as trauma. A few years ago, before I finished my therapy training I decided it was time for me to address my childhood trauma and went to see a therapist. At the time, it never occurred to me to ask my therapist about her own history with therapy, but she seemed like a nice and understanding person so I gave it a try anyway. Over the next few sessions I started to notice that my therapist was visibly (nonverbal communication) uncomfortable addressing my trauma, continuously trying to change the focus of our session on lighter issues. Trauma can have that effect on people, although I never had expected my therapist to be counted amongst those who would get such a reaction from my experience with trauma. You see, there are times when a therapist with their own history of trauma left unresolved, will act out her/his resistance in therapy despite the fact that the focus is on you. Such a reaction from a therapist can be further traumatizing or re-traumatizing for you, so in a case such as this, therapy can potentially do more damage than good. This is why it is wise for therapists to work on their own issues prior to addressing similar ones with a client, because a therapist’s often unconscious reactions to the problem you are bringing in can hurt you. In psychology, this is called countertransference and while there are many times when it can be helpful, most times it goes unnoticed or simply ignored. 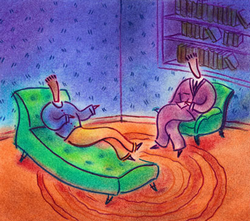 Therapists who sought therapy for themselves are better able to detect countertransference and use it in a positive way to help you progress, whereas those with no personal therapy tend to stumble in the dark. Ideally your therapist should be like a blank piece of paper where personal experiences, attitudes, values and beliefs are removed from the session so that you get to explore yourself with as little bias as possible. You can think of your therapist as an objective flashlight: someone that can shine light on the different aspects of you, showing you possibilities and potentialities as they are, without weaving their own personal attitudes, values, and beliefs into the process. It is not your role, as a client, to care for your therapist or help your therapist to work through their own trauma or emotional health, and a therapist with unresolved issues similar to yours, cannot take much further than where they are at that point. That is to say that you will go as far -in your therapy- as your therapist is willing and able to take you, typically as far as they went in addressing their own issues.